Whenever we are in need of information on anything under the sun, the first thing that comes to our mind is Google. True, isn't it? Naturally thus there was a sudden deluge of advice on what to Google, all of it directed my way, when told I was pregnant. From websites to pages to browse through, I was counseled at length on searches to help me with a well informed pregnancy and later on, delivery. The need to google, in fact, is not only emphasized as a means to guiding someone else but a tried and tested means of making oneself aware as well. I remember observing a pregnant colleague of mine investing time going through every nook and cranny of the internet, searching anything and everything related to pregnancy, childbirth and babies. So, you see how Googling and pregnancy generally go hand in hand? But, did I do the same too? Well, me being me, which is everything lazy, never really scouted the internet in much the same manner. I'm not saying that is a good thing though because being informed is always better than not being informed at all. I just thought that placing myself at the hands of my Gynecologist was what I was most comfortable with. Moreover, S took upon himself the Googling and Baby Center part of the bargain for the both of us, so I was anyways spared the guilt. I did the being pregnant part, S took care of the information gathering end and we were sorted. As you would have guessed by now, I dove in head first into the unknown realms of pregnancy and motherhood. Yes, totally unprepared. And today 13 odd days into the latter, I'm learning and discovering at each step, really. I won't say I have figured out what being a mother entails because it has hardly been a few days in this new role. Also, you never can do that, can you? But there are new bits and pieces that I'm learning about myself and about being a mother in the process. It's all very new for now. I feel as though I'm writing an exam without having prepared for it. But that is also the beauty of it, isn't it? out loud seems so strange, for now. And, well, I can't express what I feel. At least, not yet. I'm also consciously trying not to make motherhood the only overpowering aspect of my life. I just want to make sure I carry on doing everything that I was doing before she arrived. Only experienced mothers can tell me though if that's even a realistic expectation or not. 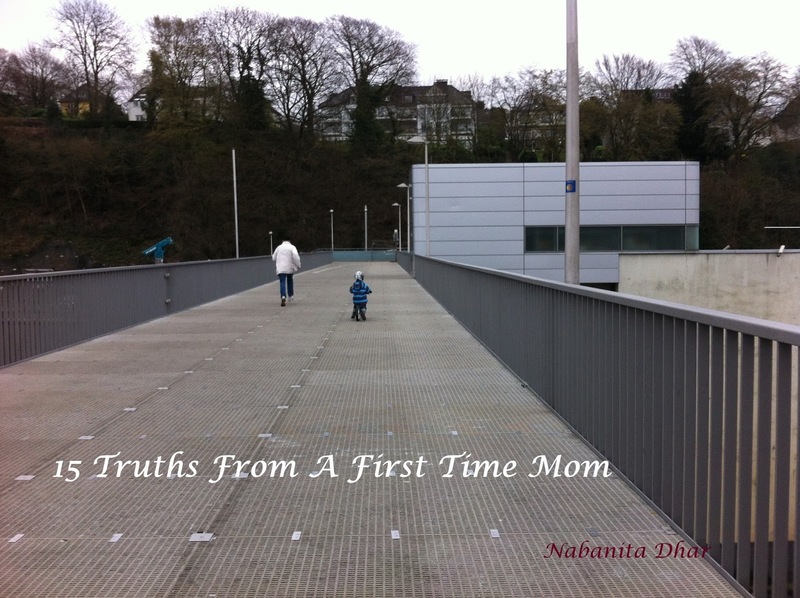 Today, however, I'm here to give you an insight into a few truths about being a first time mother, a new mother. Remember, it's all about my own experience so far and it's not even been a month so don't take it as the holy grail, alright? You become an alarm clock on a two or three hourly snooze. Yes, feeds do that to you. You seem to be on auto-feed control. Your body reacts letting you know that it's time to feed the munchkin. It's not pretty or comfortable though. You end up crying, feeling emotions you can't quite describe. If you love sleeping 8 to 10 hours at a stretch, then you can forget doing that. Well, at least in the beginning. Your sleep is divided into naps all through the day. Cleaning poop and pee suddenly doesn't seem such a bad thing after all. Yes, for some strange and twisted reason. The only scent that comes off you is that of milk, poop or pee. Or, better yet the mixture of the three. No Gucci or Roberto Cavalli. Yummy Mummy is a term you start seeing as an oxymoron. You realize Maternity Leave is anything but leave. Activities like reading a book or writing is only possible when your baby is asleep or quietly satiated on your lap. Packing which was earlier an activity limited before vacations or trips becomes something you need to do each time you go out. You bombard your friends with anecdotes about your baby, even if they are not interested. Watching a 45 minute long serial takes over 4 to 5 hours. In fact, at times is spread over days. Most visited sites change from Facebook or Twitter to Firstcry and the likes. Eating out seems to be no where in the horizon. Well, those are all I have discovered for now. I don't know what the future holds and how this journey is even going to be. But I do know I'm going to share a lot of it with you, here. Tell me what were your #NewMom or #NewDad Discoveries?